Enormous choice of payment methods and fast, multilingual website. 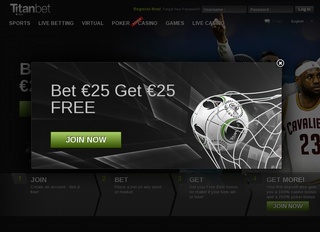 Titan Bet is one of the new additions to the online bookmaking market. The website is released in 2009. However, the bookie doesn’t start from scratch. Titan Bet is a part of the established worldwide brand Titan. The company owns Titan Poker, Titan Casino, and Titan Bingo. It’s only logical that they would continue their business with online sports betting. Titan Bet is licensed and regulated under the jurisdiction of Antigua and Barbuda. On the technical side, Titan Bet utilizes a software platform created by Playtech. This is the same software developer that offers platforms to bet365, William Hill, and Paddy Power. The fact that the Titan Bet bookie is a client of Playtech is a guarantee for a great experience and uninterrupted and secure betting. The owner of the Titan Bet business is listed as Hardway Investments Ltd. The bookie is currently in the top 160000 most visited websites worldwide. The website’s design mainly consists of black, shades of gray and green. The colors contrast very well with each other, and all the elements are clearly visible, without hurting your eyes. The middle of Titan Bet’s website covers the live betting opportunities and upcoming games. The left side hosts some quick links, a list of sports, support information and top jackpot games banners. The right side, of course, contains your bet slip, the sign-up bonus information and the top games and bets. Overall, you have everything you need on the main page, so there is no need to click too much to get to the fun part. Titan Bet is one of the few online bookmakers that offer to bet on poker games, politics and entertainment events. I haven’t seen other bookies offer poker betting, so if you are into the scene and would love to win some money – Titan Bet is the place. Aside from the limited options, players can bet on 17 sports (totaling 20 with poker, politics, and entertainment). Football, tennis and golf are just a few of them. Another great betting option is the eSports section. In there, you can find CS: GO, StarCraft 2 and big events available with set odds. I’m quite happy with the markets on Titan Bet and would love to see them grow even more in the coming years. Live betting is also available for some sports. If you are not into sports, or just want to pass some time – Titan Bet offers a Casino games section, complete with slots, roulette, cards, video poker, arcade, scratch, jackpot games and live dealers. The casino has most of the best and favorite games, so you will most probably find the specific one you are looking for. Titan Bet also offers a live casino, being streamed in real time. If you are into this type of entertainment, you can enjoy Baccarat, Roulette, Blackjack and VIP Roulette on the website. Titan Bet’s poker section redirects to the site of Titan Poker. This poker website has been on the market for quite a bit of time and is currently celebrating its tenth anniversary. 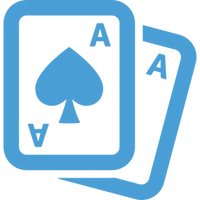 Titan Poker managed to gain the trust of players worldwide and is a great poker experience both for beginners and pros. Titan Bet’s poker can be accessed via a downloadable client or a flash plug-in right there in your browser. The downloaded version is much better, but flash lets you play on the spot, without the need to clutter your computer with more software. The odds you can bet on are usually over 70, sometimes more than 100 for football games. The rates Titan Bet offers are quite competitive with the big bookies and will leave you satisfied with your winnings. As for the various odds – the bookie offers the whole package – from full-time result, second chance, to Asian handicap and team score. 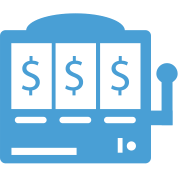 Overall the variety of betting options is amazing and offers everything a professional bettor would need. Customer service is very professional and quick to answer. The support is available throughout the whole year, so you shouldn’t worry about working hours and time zones. Either dial Titan Bet’s telephone number, proceed to write email or use the convenient live chat feature on the website. You are guaranteed to receive answers in a 24-hour period. Titan Bet’s website can be viewed in English, Spanish, German, Russian and Swedish. Titan Bet knows how important it is for players to deposit and withdraw in their chosen currency, so they accept eight types of coins and all of them can be seen in the table. The list of deposit options is enormous. Players can find the most convenient option and use it to deposit funds into their accounts. Withdrawing money is also very easy. The different methods for making a deposit or a withdraw are all listed in the table. 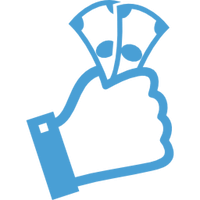 Currently, the sign-up bonus is 100% up to 200 EUR. Aside from the sportsbook, the casino has some bonus offers. The poker section wins so far with a large number of promotions and tournament offers. Give Titan Bet a try, they are worth it!